There is, or at least was until recently, an idea out there in America that every child deserves a great teacher. But that isn’t possible, because not every worker is great. According to FY 2012 Census Bureau data, U.S. public schools had a total 4,659,517 full time equivalent instructional employees for 48,212,483 students, a ratio of 10.3 to one. There may not be 4.7 million “great” workers in the entire country, depending on how strictly one defines greatness, let alone that many available just for public education. So you’ll have some great teachers, some good teachers, some average teachers, and some below average teachers. And thanks to low pay in some areas of the U.S., and union power in other areas, lots of bad teachers the schools can’t get rid of. There is a way, however, that every child could have access to great teachers. Over the internet. Just as information technology allows the best entertainers and game designers to serve millions of people at a time at a very low incremental per-person cost, so that same technology could allow millions of children access to the best instruction, exercises and practice, homework and tests. In a format that was available on demand at any time. With different teaching styles that might work for different students. And the possibility of each child working at their own pace, rather than being held back by or trying to keep up with the average for a class, and with lots of extra practice for skills they and yet to master. All that would be missing is the possibility of a trained teacher working with an individual child on something they were having trouble with. But that is something the public education doesn’t provide either – despite that student to instructional employee ratio of 10.3 to 1. Imagine this thought experiment. You offer $1,000 per school day, or $180,000 for a whole school year, for the best teachers in the country to provide video instruction, exercises, lesson plans, homework and tests equal to 3 ½ hours of schoolwork per day (and if you think the kids do more than that forget it), along with advice to parents and teachers. This would be for pre-K to 8th grade. With an equal amount of money going to online media designers to put this into video, videogame, graphic, online puzzle etc. format. The teachers could do the work required over the summer. That would be a total cost of $360,000 per teacher. Imagine the initial goal were to get ten great teachers with ten different teaching styles online for each grade. That would be $3.6 million per grade. Or just $36 million for each grade from pre-K to grade 8. That’s $36 million in total for ten great teachers per grade, plus the cost of putting and maintaining the information online. Which for this blog and YouTube (for most users) is currently zero. That $36 million would be less than one percent of the $54.4 billion the federal government spent on aid to state and local government elementary and secondary schools in FY 2013. Rounding error. Do it for ten years, and you have 100 teachers online per grade for an amount that, compared with total federal education spending, would be very little. And compared with total FY 2013 public school elementary and secondary school spending, at $525 billion current and $608 billion including debt service and capital, $36 million would be next to nothing. Or rather, 0.006%. In fact, $36 million is very little compared just with the $44.9 billion U.S. public schools spent just on instructional expenditures (other than wage and benefits for instructional employees) in FY 2013, such as textbooks and teaching supplies. Such is the magic of the near infinite relicability of electronic information, at a per-user cost that is so low that it is close to zero. It is the reason why massive, mindblowing profits are being made by some firms in the new media and information technology industries today, with some of their founders reaping incredible dynastic wealthy in a brief period of time. Create a computer application or content that could be used by one person, and it doesn’t cost much more for it to be used by 1 billion people. So even if the revenue per user is low, even just what you can get by advertizing, total revenues can be huge relative to the costs – as long as a huge number of users are attracted. In contrast to the low cost and high value of the internet, public education is very, very expensive, particularly in New York State, as I showed here. With total expenditures of $12,300 per student for the entire U.S. FY 2013, or $246,000 per 20 students. And $23,000 per student for New York City, or $460,000 per 20 students. The cost of making 100 “great” teachers available for each grade for every child in the country according to our thought experiment, at $360 million, would be just 1.4% of New York City’s total elementary and secondary school expenditures in FY 2013. And NYC’s school costs are soaring, with past deals that are set in stone assuring that they are set to soar even more – whether any education is provided or not. It seems that some would-be education plutocrats have noticed the difference between the high cost of public education, and the near zero cost incremental cost of the internet, and sought to cash in. Rupert Murdoch, for example. According to a recent report, however, Newscorp is seeking to sell its online education division, Amplify, because it lost $193 million in one year. Now I’ve just shown that paying individual teachers an amount that would be quite a bit to them, $180,000, and spending as much on converting it to online content, would cost only $36 million for ten great teachers in each grade from pre-K to 8 (yes I know there is specialization in middle school, so pro-rating would be required). Which would be just $180 million for 50 great teachers in each grade. As a one-time expense that (unlike annual spending on traditional public schools) could continue to provide education for years and years to come. So how could Amplify lose more in one year than the cost of paying 50 great teachers per grade a substantial sum to be online indefinitely? It must have done it all wrong – building a big, expensive corporate bureaucracy with lots of overhead and marketing cost to deliver what could be produced as well or better, given the plunging cost of all kinds of information technology and the broad reach of social media, by a low-cost cottage industry network. Newscorp apparently failed to learn from the trend in its own news and information industry, or the entertainment industry, where what were once massively lucrative oligopolies are under siege from online news sites, bloggers, and an army of musicians connecting directly with potential customers for a vast diversity of content. Newscorp, in fact, must have replicated the very high overhead, low production structure of the very public school sector it sought to compete with. Education was, at one time, a cottage industry. The rich hired tutors for their children, individually or in small groups. In the United States, one of the first societies to pursue universal education, parents taught their own children using the family bible. Or the community hired a teacher for all of its children, offering a one-room schoolhouse and place to live as part of the deal. Group Family Day Care providers may care for 7 to 12 children, aged six weeks through 12 years. Group Family Day Care providers may obtain separate approval to care for an additional two school-aged children. When any child less than two years of age is present, the maximum allowable number of children in care is 10. In this situation, an additional two school-aged children may be permitted with separate approval. Like lawyers, doctors and other professionals, family day care providers are licensed and have required training. But it is up to them, and their reputation, to convince parents to trust them with their children. Today’s public school system, on the other hand, is built on the industrial model. Like products on an assembly line, children are moved as a group from station-to-station (grade to grade) manned by specialists, each backed by other specialists and support staff as well as equipment, organized into a large, hierarchical organization. These education factories once allowed a decent level of education at an affordable cost level – by processing the children 40 or 50 at a time. Which was often the class size 100 years ago. They also benefitted from a low-paid labor force with few other options – educated women by custom in the public schools, nuns and religious brothers by choice in the parochial schools. There are two problems with the factory school system. More and more people want something better. And it isn’t really affordable anymore either, and not just because (including the cost of their retirement benefits and measured per hour) teachers now earn as much as (or more than) other workers. Class size has been reduced, but the ratio of students to teachers has fallen far more. That nationwide ratio of 10.3 students per instructional employee does not even include the large number retired teachers. A large number because under many union deals teachers get one or more year in retirement for each year worked. Very expensive if pre-funded, all those extra years in retirement are absolutely crushing if suddenly increased, as in all the retroactive pension increases and early retirement “incentives” in New York City, or not paid for in full while teachers are working, as is the case in many other places. So you still end up with 20 to 35 per class, despite high and soaring school spending. That is the mystery that ought to have teachers now on the job wondering what is going on. If the overall U.S. student to instructional employee ratio is 10.3, why do I have 25 or 30 kids in the class? Even given the need for substitutes in case of illness, why isn’t the class size 12? Moreover, given how high instructional spending is New York City, at $277,300 per 20 students in FY 2013, how come take home cash pay is so low for much of a teacher’s career? If only they knew these numbers. Outside New York City, meanwhile, it is the non-instructional, overhead costs of the schools that are often sky-high. As a result in FY 2013, U.S. instructional spending per student was $6,480 per student, with instructional wages, salaries and benefits at just $5,720. That is less than half the $12,300 per student total. Schools are about teaching, aren’t they? Why does so little of the money go to those actually teaching at a given time? In addition to class sizes, nothing shows the disadvantages of the factory school model more than the standardized tests everyone is suddenly complaining about. It is a bitter irony that, at least here in New York, the teacher’s union is among those complaining. Because I was a child when those early test grading machines came out, with the kids coloring in boxes labeled a,b,c or d or true and false in pencil and teachers running the cards through the machines. They spread like wildfire. Why? Because that meant less work for the teacher! Suddenly everything was a,b,c,d or true false, and a generation of kids never actually learned to write. (If I can do it at all it is because I got an old school teacher in the 12th grade who actually taught me). Basically, standardized tests ushered in an era, for many teachers, of much less teaching. Those against the tests today say that teaching to the test doesn’t lead to real learning. I say that if teaching to the test doesn’t lead to real learning, you have a bad test. In public education you still are stuck with a,b,c,d and T/F, with trick questions used to try to require real thinking or measure real understanding. And, therefore, with many of the questions turning out to be screwed up. and Asteroids to Game of Thrones. In standardized testing, the schools are still in the Pong or Asteroids era. By taking the factory school model, adding less and less classroom time and more and more years in retirement for teachers, increasing overhead, and decreasing class sizes somewhat, we have ended up with a school system that costs far more than it delivers, particularly in high spending states. To the point where if it didn’t already exist, no one would dare to suggest it. So let’s get back to our thought experiment. Imagine that a non-profit organization, perhaps with some government funding, were to put the instruction, exercises, homework, tests and advice of 100 great teachers per grade, all converted into a new media format, online for all to use. A non-profit organization that was the equivalent of a public library. Who could use that information? Novice teachers in the existing factory school system for starters. Like a new teacher faced with a classroom full of students, in my current job I was required to produce immediately and independently, or the customers would suffer. Each quarter I write 44 reports on the regional economy and commercial real estate market of metro areas around the country, among other tasks, and there is no one else to do it for me. So to get up to speed immediately I started with the prior reports of the person that preceded me, following their structure and style, and mixing in the style and structure of the other main report writer for my company. That allowed me to do a decent job immediately. Gradually, I mixed in my style and structure, but the ghost of what I started with remains here and there. If I were starting in education as a novice teacher, I would want the same head start to be available. It seems that plenty of novice teachers want the same thing. I read previously that there is an underground market of lesson plans for sale. And read recently about an online marketplace in which experienced teachers make money selling lesson plans, lectures and exercises to new teachers. Nothing wrong with that, and at $1 per lesson in the example cited by the article, the price is right. My only problem with it is this – why do new teachers have find this stuffy and pay for it themselves, out of their typically low (compared with total compensation costs) starting salaries? Why aren’t the schools giving them access to the lesson plans of 100 great teachers to pick from, and telling them to start by copying whatever style the prefer and build from there? What teachers say is the idea that they could teach to the individual needs of every one of 25 students is nonsense; they just teach down the middle of the class and hope for the best. And that if what an individual child gets in the classroom isn’t enough, their parents ought to hire a private tutor as a supplement. But not everyone can afford this. Moreover, every now and then your child is going to get a bad teacher – incompetent, novice, unmotivated, grifter. Despite all the school reform wars, in public education the teacher’s union has successfully beaten any system to remove bad teachers who do not choose to leave on their own. Whatever method is chosen, the union beats it back. Evaluation by individual principals, the equivalent of the evaluation most of us face at work? Violates due process, because those principals may be biased, incompetent tyrants! Any attempt at dismissal by one person takes years and is successfully fought in court. Groups of outside evaluators, to deal with the individual bias or tyrant problem? Drive-by evaluations with no validity! “Objective” measures such as changes in a students’ performance on standardized tests? As soon as the suckers (in NYC Mike Bloomberg and Joel Klein) went along with that one, the union changed course and started objecting to the tests, and encouraging parents to opt out. Round and round. With higher costs and overhead in each round. As the head of the New York State United Teachers said, it would never allow an evaluation system that would allow any teacher to be fired for any reason. It’s time to give up, and just level with parents about the reality – pay up in taxes and take what you get. So what to do if your child gets the bad teacher, perhaps because you didn’t donate to the right political campaign and aren’t one of the insiders who know how to make the right kind of trouble? Or, what if your child just isn’t keeping up with the class on something and needs more help? There is a huge private tutoring market for those cases, but not everyone can afford it. Online instruction could provide a lower-cost – in fact free – alternative. In fact, the whole thing could probably be financed by advertising for individual in-person evaluation and tutoring, for those who need more. The availability of online instruction would allow any teacher, good or bad, to tell any dissatisfied parent that they should just use what is available and work with their children themselves. As mentioned, at one time many parents taught their own children at home. And in recent years some parents have gone back to that, initially in response to religious or political convictions – left wingers starting in the 1960s, and right wingers starting in the 1970s. At first the education establishment persecuted the homeschooling movement, then it sought to accommodate and regulate it. More recently, with the onset of state and local government fiscal crises across the country, it has sought to promote to homeschooling save money. The first target has been high school, with courses offered online to save money on high cost of in-person public schools. (The teachers’ union got a state law banning this in New York). Apparently some students are now taking these courses for extra work. Massive open online courses, or MOOCs, were originally intended as college-level work that would be accessible to anyone with an Internet connection. But among the millions of people who have signed up for these classes, there are now an untold number of teenagers looking for courses their high schools do not offer and often, as a bonus, to nab one more exploit that might impress the college of their dreams. The greater opportunity, however, is in pre-K to 8th grade. Sometimes children can’t learn from a computer program, and need someone to show them something in person. But high schools teach things that not every parent knows. Which is why the one family I know that homeschooled through age 8 sent their children to an actual high school. On the other hand almost everyone, the poor and immigrants excepted, ought to know what is taught from pre-K to grade eight. And perhaps could teach it with the help of online instruction from great teachers. Parents that choose to homeschool, individually or collectively through some kind of co-op arrangement, could use online instruction as a tool. Between that and the use of an occasional tutor, children could be educated for far less than the cost of private school in places where public schools are inadequate. Homeschooling, however, is not for everyone. With more and more families, whether with one parent to two, having all adults in the labor force, there often isn’t anyone at home during the day. The schools, therefore, no longer provide just education; they provide childcare as well. And they play a third role: socialization, with children learning from their interactions with each other. (One motivation for homeschooling for parents is to shield their children from that socialization, but that is not what everybody wants). Not everyone who doesn’t want homeschooling, however, wants a factory school. But there is a third possibility. 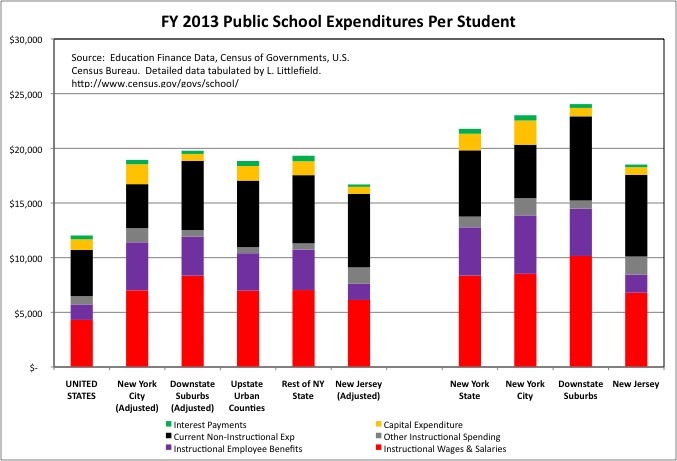 Let’s look at the FY 2013 per student cost of the public schools in New York City, and imagine a home-based form of education with most of the overhead taken out – and with a class size of 12, as for Family Day Care. And with a social network of teachers and their supervisors taking the place of the hierarchical structure, and the need to attract parents voluntarily to get that 12 students, or accept less money, taking the place of battles over teacher evaluation. The cost of wages, salaries and benefits of instructional workers in the NYC schools was $13,865 per student in FY 2013. In the cottage industry structure most of that would go to the home-based teachers, with some for substitutes to show up at their homes when they were ill. (The substitute would come to and work at the teacher’s home, unless the illness was severe). The total would be $166,380 per 12 students on average, but with a higher share of it paid while someone was working and a lower share paid to those not working. With teachers assumed unable to teach one day per 20 on average, missing more work than most workers outside education, that would mean $158,000 per home-based teacher on average, for wages and benefits. Perhaps less for less experienced teachers and those with no special needs children, and more for more experienced teachers and those with special needs children in the group. The children would spend most of their time working on their own, using internet-based instruction on laptop computers, or watching instruction as a group on a television, with the teacher working with individual students one at a time when not taking a break. The $1,575 per student NYC spent instruction (other than on wages salaries and benefits) would surely cover the laptops, anything the teachers wanted to put on them, and any other supplies they would want. That would be $18,900 per year for 12 students – or perhaps somewhat less with some to cover the instructional services and supplies cost of administrators. With electronic instruction taking over most routine teaching tasks, a sufficiently versatile teacher could teach children in more than one grade at the same time. Or take a set of children from pre-K to 8, and then start over with another set. The teachers would work out of their home, like Family Day Care providers. Perhaps they would need some extra space as a result, and they would also need to maintain and clean the space the children used. Perhaps some of the $1,929 per student the NYC schools spent on Operation and Maintenance of Plant, or $23,150 per 12 students, could be paid to the teacher was well. To put it in apartment rental terms, that would be an extra $1,929 per month. The NYC schools spent about $500 per student on school administration (ie. principals). Perhaps that much could be spent on cottage industry administrators/evaluators. They would spend six days with each teacher each year to check up on them and make sure they were doing a good job. On some of those days, they could also cover for illnesses. One administrator could thus oversee 30 teachers with a total of 360 students and get paid $180,000 per year in wages and benefits. The administrators would work out of their own homes, holding meetings in public libraries and other public spaces. All these figures would be lower elsewhere in the country than they are in New York City, but so would the cost of living. And even at that, money would be saved compared with the high cost of our factory model school system. To make the cottage industry work, perhaps participating families could be required to have an adult be present in the teacher’s home one school day in ten, to help out as needed at the direction of the teacher. This would require some scheduling flexibility on the part of employers. But with employers increasingly caught between increasing labor scarcity, as the Baby Boomers retire, and the unwillingness to raise wages, because they can’t charge more (because their customers are broke), they are trying to come up with any means possible to retain employees — other than higher pay. So scheduling flexibility should be more and more common. And the least powerful employees are often those that don’t work 9-5 anyway. A cottage industry education network would have to be based on voluntaryness, with no parents forced to send their children to a particular teacher, and no teacher forced to accept a parent who didn’t show up as required or a child who was unwilling to cooperate. This would act as a check on the level of effort and empathy that is lacking in a bureaucracy. As it does for any other industry. If a teacher only attracted ten children, their compensation could be reduced. What about social interaction, for children with other groups of children and for teachers with their colleagues? Teachers who were part of a local network could walk their students to a local park or recreation center, and converse with each other as the children play with a broader group of neighborhood peers. Local teachers could meet up after school in each other’s homes or local restaurants, coffee shops and libraries. Teaching specialization? Teachers could exchange students with other teachers in the neighborhood, with each focusing on one subject, or rely on what was available online. School sports? School plays? How about community sports, plays, bands for pre-teens and teenagers? School libraries? How about the local public libraries, which at least in cities would be in walking distance? AP classes? How about community colleges? These options perhaps show to whom improvements to the so-called Common Core and related tests should be directed. Parents, who want to know what their children should be learning and how far along they are. The Common Core, whatever it is and however it evolves, should be put online with zero education jargon. Cottage industry education. Charter schools. Private schools. NOT the existing factory school system, although those within it could of course continue to use these tools if they choose. State and local governments face a future of rising taxes and declining public services because of underfunded public employee pensions (and high debt levels and inadequate past infrastructure construction). The pension underfunding resulted from retroactive pension increases scored by politically powerful public employee unions, and taxpayer underfunding of the pensions the employees had been promised to begin with. Teacher pension plans are among the worst affected. The distribution of the guilt, and the timing of the point when the disaster can no longer be put off, varies from place to place. It will be exacerbated on the expenditure side by the ever-expanding needs and demands of seniors in our aging population and the debts older generations are leaving behind, and on the revenue side by the fact that younger generations are poorer than those who came before. Pension underfunding means public school teachers will be getting more expensive per student. Falling general wages – all the way up to the .01 percent and soon even them – mean less is paid in taxes. This means the general public can afford fewer public employees in general, and teachers in particular. With these intensifying pressures the whole idea of school reform – providing the schools with more resources but expecting them to do a better job – is being abandoned. In some places because politicians, supported by aging taxpayers, want to cut education funding even as public education retirement costs soar. And in other places because the teacher’s union, having scored a huge increase in funding and earlier retirement, is using its political power to cram down expectations, particularly with regard to poor children. No matter what you thought of that battle, it’s time to face the facts. It’s over. The unionized, tenured, high-overhead, hierarchical, civil service factory school system isn’t going to deliver more for less. Or more for more. Or less for less. It is going to deliver less for more, or nothing for the same. All across the country the schools now have two primary goals: pay retirement benefits, and avoid bankruptcy. It’s time to jack up contributions and pay the full cost of the retirement benefits while avoiding bankruptcy remains an option. Children, however, will still need to be educated somehow. In New York City, the United Federation of Teachers is always there, looking to grab more for those cashing in and moving out, and provide less in return. Politicking, putting out propaganda (if enough people read this it will probably claim that the goal of my suggestion is to turn teachers into pauperized Uber drivers), getting deal after deal that can only be changed in their direction – more in exchange for less. Individual parents only pay attention for the few years their own children are in school, and don’t know what happened then to create the situation now. Politicians are also temporary, and are either put in place by the union directly, with no one representing taxpayers and school children on either side of the bargaining table. Or are not as smart, nor there for as long, nor have the institutional knowledge of the UFT, which plays the long game. And never gets held accountable in the present for what was said and done in the past. The UFT has turned those advocated higher school spending and teacher pay in NYC, back when they were low, into fools by making sure the increase didn’t go into the classroom and then demanding more money. Including me. And turned those politicians who promise “school reform” if elected into liars. The UFT won, and will win, 100 percent of the time, alternating promises of cooperation with a reality that shows up after they get what they want. I have paid attention for long enough to understand it’s time to surrender and give up school reform. Stop trying, stop lying, and pursue alternatives. It’s about lifeboats. The Titanic is going down as a result of past sabotage that cannot be fixed, even as more and more patches are applied. There are only enough lifeboats for the first class passengers, and those with connections. Younger generations of parents are going to need lifeboats for their children. It is in everyone’s interest to create them.